"If you're asking my opinion, he's only being stared at all over again." 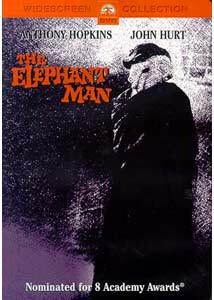 There probably could have been no better film for David Lynch to make his Hollywood debut than The Elephant Man. Always concerned with the outsider in his work, he found the ultimate real-life outsider in John Merrick, the circus freak whose body, distorted by pituitary disorders and neurofibromatosis, was the subject of study by Victorian Dr. Frederick Treves. The result gives us a look in the mirror to see whether we are men, or in fact monsters. Dr. Treves (Anthony Hopkins), while at a tawdry circus, finds his attention drawn by a freak show exhibit, The Elephant Man, that is being shut down by the police. Obtaining a private audience from Mr. Bytes (Freddie Jones), Treves is startled to find John Merrick (John Hurt) afflicted by an aggregation of deformities both startling and horrifying in nature. Treves first hires Merrick out to display to a physicians' society. When Bytes beats Merrick savagely to the point of requiring medical care, Treves admits Merrick to the London Hospital. Despite pressure to remove him from the staff and the head of the hospital F.C. Carm Gorm (Sir John Gielgud), Treves protects and warms to Merrick, then even befriends him. Soon London society, nauseated though it may be, is anxious to visit Merrick. But neither he nor Treves has taken into account Bytes and his fury at being deprived of his livelihood. For Lynch to make his mainstream film debut with such a stellar cast is quite astonishing. The very cream of British film and stage actors are present, with the notable addition of Wendy Hiller as the head nurse at the hospital. Hopkins of course turns in a powerful performance, and Hurt emotes through many pounds of makeup to provide an unforgettable and moving experience. Gielgud is splendid and proffers a humorous wisdom sadly lacking from many other characters in the piece. Hopkins nicely underplays Treves much of the time, most notably with the slackjawed astonishment he displays when he first sees Merrick. His reactions as he slowly comes to realize that Merrick is not an imbecile, but a sensitive and intelligent human being, are perfectly done and finely moving. Freddie Jones, notable for playing a career full of lower-class English scum, is notable as well as the cruel and sadistic Bytes who cannot help but kill his golden goose. The always reliable Anne Bancroft does a fine job with a tiny part as Mrs. Kendal, the actress who firsts discovers the artistic soul lurking within the hideous form of Merrick. Wendy Hiller (Pygmalion, I Know Where I'm Going) believably provides a sweeping character arc for Mrs. Mothershead, from coldly cruel and callous, to deeply caring of and solicitous for Merrick. As the closing credits note, this picture is based on the true story of Merrick, and not upon the now-forgotten Broadway play that was running at the same time as its premiere. From my knowledge of the case, the depiction is generally accurate, although I don't think that the real Dr. Treves ever quite managed the self-reflection that Hopkins portrays in the film. Lynch offsets the intensely human drama with his usual fascination with mechanization; several intercuts to spewing smokestacks and men laboring at relentless machinery inescapably remind the viewer of Lynch's disturbing first work, Eraserhead. Indeed, the slurping sounds made by Merrick often bring to mind the discomfiting noises made by the repulsive lizardlike infant in that picture. The black & white cinematography needs comment as well. It's intriguing how much the principals in the documentary discuss the possibilities of the film in color, because if ever there were a picture that cried out for monochrome, this is it. Freddie Francis' powerful cinematography, when combined with Lynch's devastatingly unnerving visual sense, results in an epochal cinematic experience. The beauty and hideousness of Victorian life, as seen alongside Merrick's pathetic form, are brought to life in a vivid manner. The music is notably absent for most of the picture, other than the musicbox theme representing Merrick's mother that returns from time to time, and a wildly bacchanalian variation on it as drunken curiosity seekers storm Merrick's quarters late in the picture. The one misstep is using Barber's Adagio for Strings (to my mind the most heart-rending music ever written) over the concluding sequences. Already incredibly moving, the music is overkill and for the first time makes the viewer feel manipulated rather than genuinely moved. One of the most moving films ever to come out of Hollywood, The Elephant Man is a startling and effective artistic achievement that has its heart in the right place. Anyone who has ever felt like crying out, "I am not an animal! I am a human being!" will identify with Merrick's plight and can hardly avoid being moved to tears. Image Transfer Review: The anamorphic black & white picture is presented in gorgeous detail. Textures and shades of gray are rendered very well, and not a bit of frame damage is visible. Some segments display heavy grain, but this is clearly intentional on the part of Lynch to produce a stylized dreamlike state. Black levels are excellent as are shadow details. Regular readers will know that I adore a good black & white picture, and this is appropriately as gorgeous as they come. Audio Transfer Review: Both 5.1 and Dolby Surround tracks are provided in English, as well as a French mono track. The 5.1 track has excellent spatial definition (at times almost overdone) and lifelike reproduction. Some sequences have hiss, but this seems to be part of the sound design (along with the persistent industrial thumping that underlies Lynch's vision), and thus no points are lost here for that. Bass levels are good, and range is generally excellent. Dialogue is clear throughout. I found very little difference between the 5.1 and Dolby Surround tracks. Really very little to complain about here. Extras Review: When I heard that this movie was coming from Paramount, I didn't expect anything at all for extras. After all, David Lynch is notorious for not wanting to discuss his work or provide extras, and Paramount is still only warmed to the idea of added material. Imagine my surprise to find that the disc contained a very good documentary with plenty of interviews (though, of course, not with Lynch), plus other worthwhile extra content. The documentary, The Elephant Man Revealed (29m:59s), includes talks with the producers, including Mel Brooks, John Hurt and makeup artist Christopher Tucker, as well as cinematographer Freddie Francis. While the lack of participation by Lynch and Hopkins is regrettable, the result is still very worthwhile. Hurt's recollections about being hired for the part are notably amusing. Brooks tends to talk in general platitudes, but overall the result is quite gratifying. There is also a shorter featurette bringing one into the workshop of makeup artist Christopher Tucker (02m:39s) to look at the 22 models and appliances used to deform Hurt. A narrated photo gallery running 04m:24s provides a closer look at the makeup work while getting a narration from Tucker. The makeup effects hold up even today, and this look behind the curtain is particularly welcome. Eccentric as it may seem, this disc is unchaptered (as was the case with Lynch's The Straight Story); apparently the director wants viewers to only watch from beginning to end. This is fine for most folks, but those with a DVD player that doesn't properly bookmark when shut off will surely be displeased with this decision. The trailer is badly scratched and damaged, making the picture here look all the more astonishing. A moving and sensitive production, packed with superb actors, given an immaculate transfer and with a surprising amount of extras. Do not miss this DVD.